How pro cyclists have eaten over the past 113 years to fuel their Tour performance. 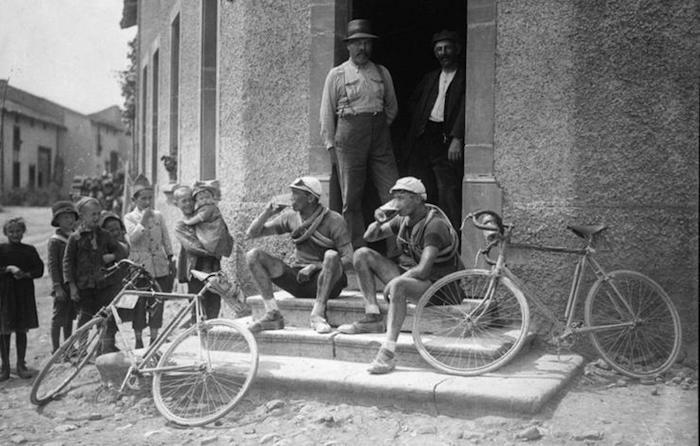 If a Tour de France rider today pulled a swig of wine mid-stage, the world's collective jaw would drop—but a hundred years ago, drinking and even smoking were de rigueur. For a look at how the Tour evolved from a scrappy moving picnic through rural Europe into a full-blown celebration of nutrition and exercise science, read on. The first Tour de France was won in 1903 by chimney sweep Maurice Garin, who reportedly ate at bars and drank from fountains to sustain himself during the race. Cycling's love of coffee has never gone out of style—energize your ride with Puncheur, Bicycling's signature whole-bean coffee! 1904: Winner Henri Cornet's food rations were 11 liters of hot chocolate, four liters of tea, champagne, and 1.5 kilograms of rice pudding in a day, according to The Science of the Tour de France: Training Secrets of the World's Best Cyclists. During the race, cyclists had to stop at checkpoints to prove they were following the itinerary—racers could eat and replenish their energy at stops that had food and beverages. 1910s: Without specific food stops or pit crews, and lacking modern technology, riders stopped along the road to refuel with outside assistance—a disqualifying offense in modern times! One well-to-do cyclist, Thompson says, actually had his butler set up a full picnic on the roadside mid-stage. “It was very unscientific. You just ate something you thought would fill you up, similar to what you’d bring on a picnic,” says Thompson. And in France, that meant a traditional European carb-heavy diet of bread and pasta—a tradition that continues today, with some modifications. Speaking of picnics: While there isn’t a definitive point when cyclists started using musette bags to carry food, it might have been around the time World War I ravaged Europe. Musette bags for cyclists roughly resemble those used by military troops in World Wars I and II, and the use of the musette bags in races allowed cyclists to grab-and-go with their snacks, rather than stopping to eat. 1900-1960: Who needs sports drinks? Riders drank alcohol during the race, from beer to wine to champagne, for both hydration and (let’s be honest) a more fun ride. 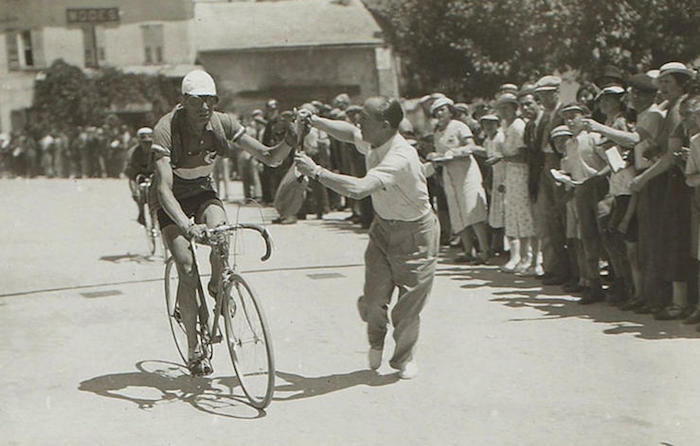 During the 17th stage of the 1935 Tour, nearly the entire peloton took a break to booze with locals—Julien Moineau the rider who passed on beer wound up winning the stage. 1926: Some things never go out of style—riders were caught chowing down on bananas for simple-carb fuel in the 1920s. As early as 1939, cyclists started to consider nutrition as somewhat important to their racing. 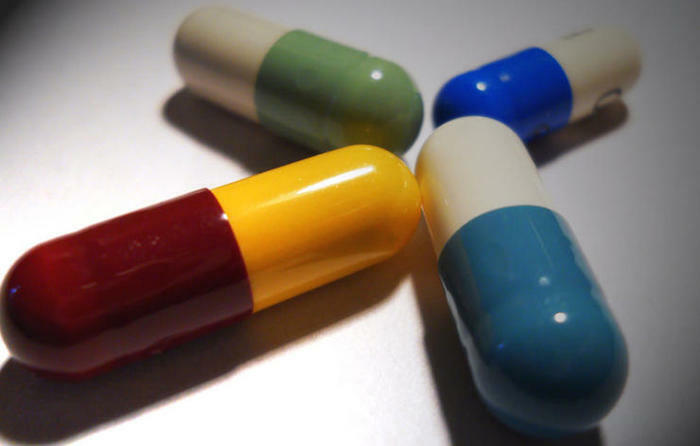 At the very least, they started taking vitamins to stay healthy and improve performance, according to this study from the University of California. 1960s: Eddie Merckx was a major fan of big Sunday meals with family, says Thompson—and that includes cake. "There’s a quote, and I remember noting it, because it showed that racers weren’t looking at nutrition very carefully then,” says Thompson. &ldquldquo;Merckx says, standing at the pastry tray after a big meal, while grabbing a cake, ‘It’s not the pastries that hurt, it’s the climbs.’ "
1965: Gatorade is invented, and the field of sports nutrition will never be the same. “It’s about salt. It’s about basic sodium, and that’s what hurts us if we can’t keep that in balance,” says sports nutrition expert Allen Lim, founder of Skratch Labs. 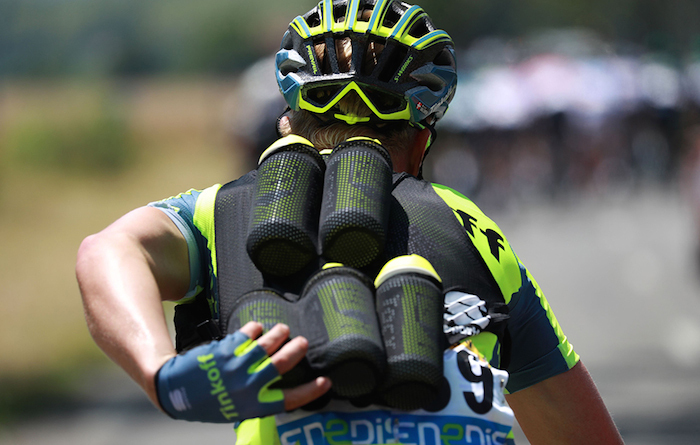 Gatorade was about to solve that problem for endurance athletes—including pro cyclists in the Tour. 1970s: A carb focus begins both pre-performance and during performance as racers search out carbohydrates versus just ‘food in general.’ Sports drinks become more and more popular, with Gatorade leading the charge. Scientist Gunvar Ahlborg is credited with the concept of ‘carb loading;’ he published several papers promoting the need for carbohydrates before and during exercise. 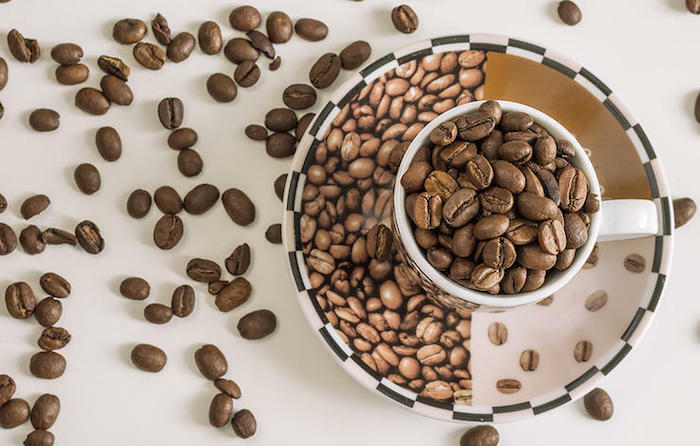 By 1985, caffeine is established as an ergogenic aid; drinking coffee pre-race is even more common, according to a report from Louisiana State University. 1988: A study published in the International Journal of Sports Medicine looks at five 1988 Tour de France competitors and finds that, on average, "they consumed 24,700kJ per day and expended 25,400kJ.” Their fluid intake averaged 6.7 liters per day, and 61 percent of their diets on average consisted of carbohydrate, at a rate of 94 grams per hour while racing. The major carb source? Cakes eaten during the race. 1980s: Coca-Cola’s increasing popularity—set against the backdrop of a world now terrified of fat—had racers drinking soda for recovery, and nutritionists lamenting. 1987: Sports gels are invented for stomach-friendly carb-fueling. The supposed first is Leppin Sport's Squeezy; its successors, courtesy of Power Bar and others, would become essential to riders during the '90s. 1990s: Riders were still engaged in European eating patterns, but things were beginning to change, says nutrition expert Allen Lim, who began his cycling career in the '90s. "The 7-Eleven team was the first to bring a chef on board for the Tour, and he was there to make sure the food quality was high, and make sure the hotel didn’t screw things up and did make some fresh food," he says. "That freshness, that food made with care, was so different than the hotel food that the riders were used to. "Tour food was based on what you could get, which in France meant bread and pasta," he adds. "In France, the low-end food is really crappy and the high-end food is amazing, at least in respect to hotels where riders would end up." 2005: Allen Lim—of Feed Zone fame—begins cooking at the tour, ignoring the standard pre-race pasta in favor of rice. His racers love it, his cooking staff—all old-school Europeans—do not. "Just before the 2010 Tour, I was packing things up at the service course and in a back room found about 15 rice cookers that the Euro staff had stolen and tried to hide from me,” he recalls. But he kept cooking it, and other teams started to catch on. "Later, many of those same Euro staffers came back and apologized to me, which was really nice... they told me they had become big fans of the rice cooker,” Lim says. Thanks to Rodale for the content.